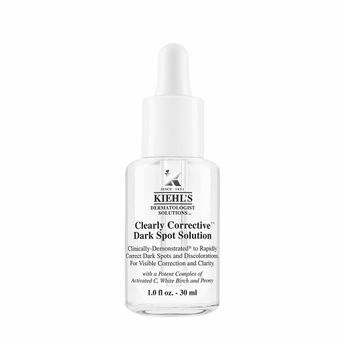 Clearly Corrective DARK SPOT SOLUTION is a fast-acting serum that evens skin tone and diminishes dark spots to impart overall radiance and luminosity to the skin: In as little as 2 weeks, 55% of women clinically demonstrated a significant reduction in dark spot intensity. In 4 weeks, 69% of women clinically demonstrated a continued reduction in dark spots intensity and 73% of women showed a significant reduction in acne scarring. Reduction in other skin discolorations was clinically evident among 69% of women.In 8 weeks, 87% of women clinically demonstrated more uniform skin tone to deliver breakthrough clarity. With continued daily usage, Clearly Corrective helps to prevent the formation of future dark spots and other skin discolorations. No Silicones. No Parabens. No Fragrance. No Colorants. No Optical Diffusers.